No blue boxes or breakfast here. But investors prefer discount jewelery chain owner Signet to Tiffany these days. The television ads for jewelery stores Jared, Kay and Zales may be unbearably cheesy. But their marketing slogans stick in your brain. "He went to Jared!" "Every kiss begins with Kay." "America's Diamond Store." That's great news for Signet (SIG), the company that owns all three of these mall-based chains. 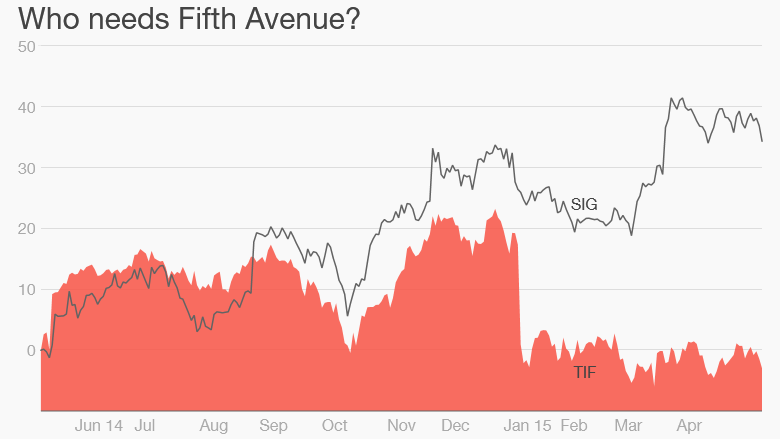 In fact, Signet has done much better lately than the venerable luxury jeweler Tiffany (TIF). Signet's stock is up more than 30% in the past 12 months, while Tiffany shares are down nearly 5%. They've plunged 20% this year alone. Sure, Tiffany is much more prestigious. The iconic blue boxes. Audrey Hepburn with long black gloves and a cigarette holder in the classic movie version of Truman Capote's "Breakfast at Tiffany's." But Signet's sales are expected to rise 13% this year. Tiffany's? Just 1%. So much for the notion that the rich will keep buying stuff no matter how the economy is doing while the middle class pulls back. It makes sense. People are watching their spending more these days. But jewelry remains a go-to gift for birthdays, anniversaries, Valentine's Day, Mother's Day .... and of course, engagements and weddings. Why pay big bucks for a diamond from Tiffany when you can get a decent, more affordable one at the mall ... and still have money left over to go buy something else at the Apple Store? Brian Angerame, manager of the ClearBridge Mid Cap Core Fund (SBMAX), owns Signet and calls the stock "an underappreciated category killer." He thinks that the company, which just bought Zales last year, still has more room to grab market share from smaller, independent jewelry stores. Arun Daniel, co-manager of the JOHCM US Small Mid Cap Equity Fund (JODMX), owns Signet as well. He also thinks that Jared, Kay and Zales can easily keep growing at a solid pace because the jewlery business is so fragmented. "There is so much low-hanging fruit in the industry," he said. Daniel is not worried about the fact that many of Signet's stores are in malls either. While much has been made about how America's shopping malls are dying, that's not exactly true. Yes, many underperforming malls -- particularly in urban areas -- have been closing. But there are plenty of upscale shopping centers that are thriving. And Daniel says that a big chunk of Signet's stores are in the better quality malls. Signet also owns another mall mainstay -- Piercing Pagoda. 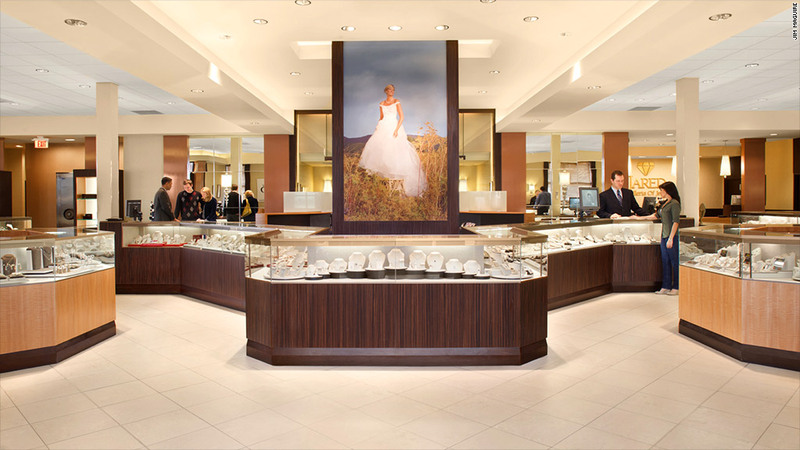 Additionally, Signet benefits from the fact that it has far less international exposure than Tiffany. The strong dollar is a big concern for Tiffany right now -- especially in Japan. Tiffany has also said that tourists aren't spending as much at the flagship store on Fifth Avenue in New York and other U.S. locations because of the weaker euro and yen. Signet does not have that problem. European and Japanese jet-setters aren't coming to the U.S. to shop at malls. And while Signet does have a U.K. division, it only accounts for about 13% of the company's overall stores. So make fun of those sappy commercials for Jane Seymour's Open Hearts jewelry all you want. People are buying them ... and Signet stock.